Maretron's ACM100 is a device which monitors AC power sources and outputs information about these sources onto the industry standard NMEA 2000® marine data network. The ACM100 can monitor power busses, generators, or utility power. ACM100 output information is then displayed with networked NMEA 2000® equipment such as the Maretron DSM250 or DSM410 dedicated display or with NMEA 2000® compatible software such as Maretron's N2KView®. Best of all, the ACM100 is NMEA 2000® certified so you can view any and all AC information anywhere on the vessel using a compatible NMEA 2000® display. 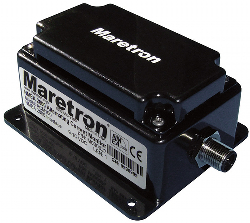 The ACM100 is a key component of Maretron's N2KView® vessel monitoring and control system.